The ECG signals can be downloaded from the THEW server in ISHNE format. To read the Holter ECG ISHNE format please refer to the description provided here. 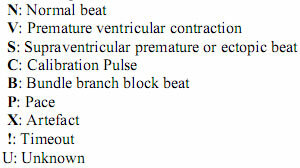 Example of ISHNE files (ECG and annotation) and reading procedure are provided below for C++ and Matlab environments. To read the files from the THEW, we provide MATLAB and C++ procedures to be downloaded from the links below.